Planet J’s Go Green Workshop on pot cultivation of vegetables and flowers for students in the age group 12 to 16 years was held on Saturday, November 1. 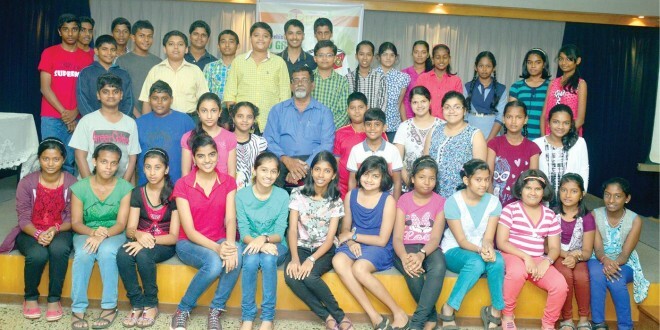 Forty one students from in and around Panaji, Margao, Mapusa, Revora and even Honda-Sattari, participated in the half-day workshop conducted by Miguel Braganza. The workshop began with an introductory session on treating the plant as a “friend” and knowing its likes and dislikes and threw open many issues. The intelligent and well-informed participants had most of the answers to the probing questions asked by Braganza on seeds, soil, water, air, light, temperature, humidity and more. The power point which followed was based on visuals in vegetable and flowering plant cultivation in Goa and was used to reinforce the learning on light and water requirements of plants. In addition to nitrogen-fixing Rhizobium japonicum culture, the participants were shown Mycorrhiza culture that helps in nutrient absorption and Trichoderma viride that is used to prevent soil-borne diseases. A demonstration of the “Rolled Towel Test” to check the germination percentage of seeds was demonstrated and the students did a hands-on practice using pre-soaked moong seed. For the next demonstration, Braganza used a grow-pot that had a coco-peat block in an art paper packet which opened into a pot. Participants did planting of spring onion and seedlings in re-hydrated coco peat using the grow pots and fresh water. During the lively Q & A session, the students had a number of questions on how to raise seedlings and grow vegetables, especially tomatoes. They also wanted to know if seeds of fresh tomatoes from the market could be used. The difference between hybrid and open pollinated crops and the variability of seeds in the second generation was explained based on the Mendelian laws of inheritance. Information of where to get seeds, plants and manures was also shared and the participants were invited to subscribe to the bsg-goa@yahoogroups.com for future interaction. Quite a few students wanted to know if such workshops could be conducted in their schools or villages. The workshop ended with participants receiving a certificate at the hands of Braganza. I enjoyed the workshop and will definitely plant atleast one plant. After the workshop, I want to plant more plants. Amazing workshop! I enjoyed it because I learnt a lot. I liked the practical session the best. The workshop was very interesting and informative and helped in understanding organic farming better. There should have been more practical session and plants to take home. I had many doubts which were cleared by Mr Braganza and I would like to say thank you to Planet J.
Mr Braganza answered all my questions and explained everything very well. I am planning on growing many plants and have a farm of my own someday. Thank you sir and Planet J. A very interesting and educational workshop. It was a good learning experience and I hope to attend more of Planet J’s workshop. The quality information given by Mr Braganza has definitely encouraged me towards organic farming. I liked the things Sir, taught us. I will starting cultivation on our property due to the knowledge I got from the workshop. The presentation on growing onions was very interesting. I loved the workshop and the practicals. © 2019 The Navhind Times Events.